CRASH TEST: The air cannon used in impact testing at the OBO laboratory in Palmerston North. The Antipodean collider is actually a form of air cannon used in testing helmets, face masks and other protective gear developed by the Palmerston North-based sports equipment manufacturer, OBO. OBO is now well into the design and prototype construction stages of developing a new mask, for which the company has received a boost of $217,000 from the Foundation for Research, Science and Technology. Company founder Simon Barnett said the mask is able to take a direct frontal hit from a ball spat out by the cannon at 160kmh. He said OBO wasn’t interested in mass- producing “one size fits all” helmets or masks, but preferred to concentrate on smaller, niche markets with equipment designed for specific purposes. The initial focus was on face protection for players in cricket, softball and hockey and Mr Barnett and his company are high in their praises of goalies everywhere and believe the security their masks offer boosts confidence. The new mask fits the niche market philosophy well. For example, OBO has protective gear designed specifically for hockey goalkeepers, and for softball pitchers and cricket wicketkeepers. “In hockey we have existing face protectors for short-corner protection and during the running phase of the game, but we wanted to improve on it,” he said. Mr Barnett was particularly critical of cricket face protectors which “gave” sufficiently to allow serious injuries such as that suffered by Black Cap Daniel Flynn last year. OBO’s new mask, being developed in association with designer Rob Whitfield, employs materials and features about which the security- conscious company is not saying much at this stage. However, the first of the helmets should be ready for assessment by sportspeople in March next year. The company will then consider this last-minute advice in any fine- tuning before going into production. Mr Barnett said the prototype of the mask offered good visibility – “almost complete peripheral vision” – and because of the materials used and shapes and angles of the parts, could withstand a direct frontal hit from a ball travelling at 160kmh. 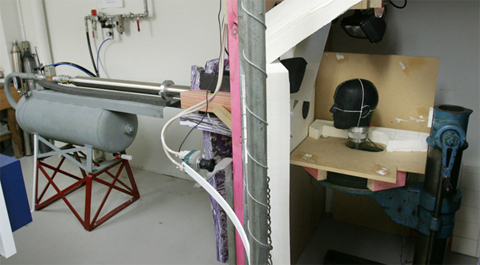 The air cannon in the developmental laboratory was coupled with a camera capable of taking 20,000 images a second, allowing a detailed analysis of the actions of ball and mask under impact. So impressive has the mask been to date that possible applications have emerged in police riot gear. But Mr Barnett said any police application was “further down the track” and would involve designing a new helmet under the company’s purpose-build philosophy. OBO began in 1994 with a dedicated range of equipment for hockey goalkeepers under its own brand name. Although global expansion had been rapid, OBO had not forgotten its origins, said Mr Barnett.